The boys love playing games at festivals/fairs/amusement parks. They love the ball toss games, especially the cup game. I thought I could try to recreate it on a smaller scale for a fun afternoon at home. We even had some candy prizes! I spray painted the outside of the box black. It doesn't have to be painted (or even well in my case), I just had a few extra minutes one day. Once it was dry, I colored the top of a few dividers different colors. I used green, purple, blue, and red. I assigned the different colors point values: blank/brown 0, Green 2, Blue 4, Red 4, and Purple was worth 5 points. 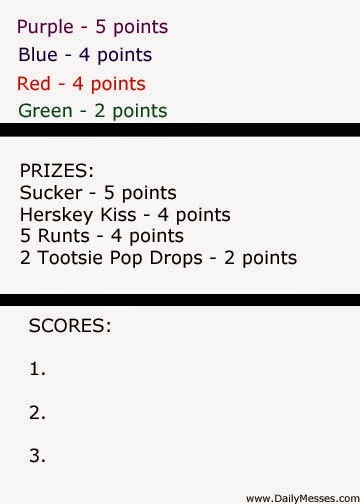 The prizes were whatever I had in the pantry, so we had a sucker worth 5 points, a Hershey Kiss for 4 points, 5 Runts worth 4 points, and 2 Tootsie Pop Drops were worth 2 points. DM TIP: I wanted to have the top of the dividers about the same height as the top of the box. However, I didn't think of that until I had already painted the box and didn't want to cut it down. The boys had just finished off a box of cereal that fit perfectly in the bottom of the box. I placed the cereal box in the bottom and the dividers on top of the cereal box. It worked out great!